Description: The flowers are densely clustered on cylindrical flower spikes. 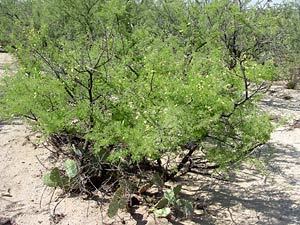 The flowers are followed by up to 6 inch (15 cm) long, flat, curled, green seedpods that dry to a dark brown color. The leaves are green, alternate, and bipinnately compound with oval leaflets. The branches have wickedly sharp, curved, cat claw-like thorns that can easily scratch skin and snag clothing. 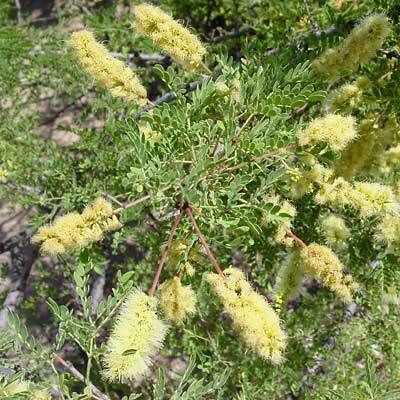 Close encounters with this plant can leave you looking like you were in a cat fight. Butterfly Plant – The flowers attract butterflies and numerous other insects, especially bees. Fragrant – The flowers are sweetly and intensely fragrant with a wonderful floral honey-like scent. Plants in full bloom can be smelled from 10 feet (3 m) or more away.